This article was taken from our archives. It first appeared in The Bermudian in December 1984. It has been reproduced exactly how it was originally intended. For close to two hundred years, the name Musson and Flatts were synonymous. At one time or another during those two centuries, the Mussons owned most of the land at Flatts, built some of the finest homes there, and directed much of the local commerce. The Mussons themselves have died out at Flatts, but most of the buildings they knew and owned still remain. One of them, “Frascati,” the major Musson homestead, is slated for demolition. At this time of “Frascati’s” impending destruction, it is highly appropriate to pay a tribute to the Mussons and their kin. By all accounts, the Mussons were a remarkable family. Historian W.E.S. Zuill, who is descended from the Mussons, describes them as an able and ambitious clan, who rose from simple origins to a place of great prominence by the last quarter of the 18th century. Miss Anna Maria Outerbridge, who knew some of the Mussons first hand, described the men and women as intelligent, attractive and aristocratic. 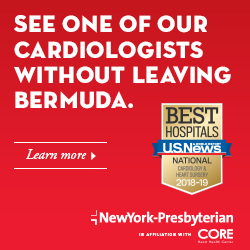 She also mentioned, however, that “in some cases their morals and business principles were not of the best.” While the latter comment may well be accurate, we must note that the 19th century Bermudian newspapers praised certain Mussons for their fairness and integrity, with a sincerity that still rings true. To trace the Mussons back to their early days, the first one recorded as living at Flatts was William Musson, who was a cordwainer or shoemaker in the 1720’s. He apparently owned a fairly substantial house at the Flatts, as the General Court met there several times in the 1730’s. Perhaps he built the oldest part of “Frascati,” and perhaps he kept a tavern there, renting out the largest room to the Court for its meetings. 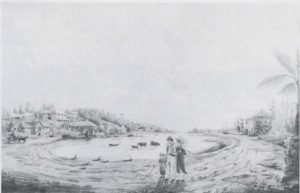 A painting of Flatts Village, c. 1820, by Driver. “Frascati” is seen in the distance, above the heads of the people in the foreground. One might wonder why the General Court (roughly speaking, today’s equivalent of the Supreme Court) met at Flatts. Flatts is a sleepy byway today, the last place a Court would ever meet. In William Musson’s time, however, Flatts was a thriving commercial centre, second only to St. George’s. It had the best harbour along the North Shore, and was a natural trading centre for Devonshire, Smith’s and Hamilton Parishes. We must remember that at this time, the city of Hamilton had yet to be heard of, and ports such as Flatts, Salt Kettle, Riddell’s Bay and Ely’s Harbour commanded the trade that was subsequently absorbed by the new capital. William Musson’s sons, William and James, became sea captains and traders, and made Flatts their home base. Both of them did well. William lived in the house on Flatts Hill that is presently known as “Fairview” and is the home of Mr. Colin Cooke. James lived in the old part of “Frascati,” and it is traditionally said that he built it, probably around 1750. The house is certainly a fine example of early-to-mid eighteenth century architecture, with its gable roof, massive chimney and low eaves. 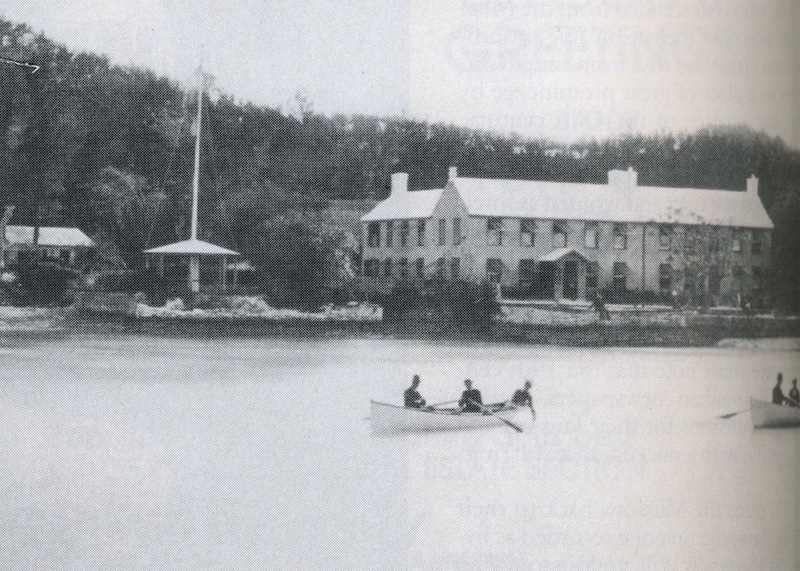 While many Bermudian sea captains built their homes inland, James Musson lived right next to his wharf. No doubt he wanted to supervise the handling and storage of his cargoes first hand, and to make sure that no harm came to his ships. It has been said that he lived near the wharf so that he could supervise smuggling operations there, but research proves this claim hard to substantiate. 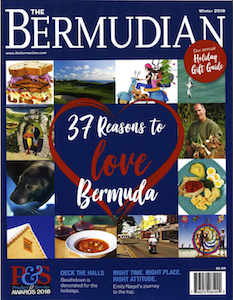 In the face of so many natural obstacles, Bermudian traders were desperate to get ahead and make a profit, and many of them used whatever means they could to conceal goods from customs officials. The practice was widespread during the 18th century. If James Musson did smuggle, he was certainly one of many. Clayton Trott, painted by John Green c. 1780. Clayton was born at “Frascati,” a son of the Hon. Samuel Trott and Elizabeth Musson. James did do well for himself materially, and proceeded to buy up real estate at the Flatts. At one point, he and his son-in-law bought the large Corbusier estate (present day “Orange Grove”) above Flatts Hill, and sold it soon after, doubtless for a profit. yet it appears that things took a turn for the worse for him later in life, as he mortgaged his house to his children in 1803, and when his estate was eventually settled, it was found that there were not sufficient assets for pay off the mortgage. One of his sons, James Jr., had to pay off the brothers and sisters to acquire “Frascati” for himself. Whatever his eventual fate, James Musson had set the pattern of personal ambition and shrewd business management which most of his children would follow. Of his eleven children, seven were especially successful: Elizabeth, John, Susan, James Jr., Giles, Robert and Samuel. Elizabeth married Samuel Trott, son of the Hon. Samuel Trott of “Walsingham.” Elizabeth and Samuel built the western house at “Frascati,” immediately next to her father’s home, probably in the 1770’s. The fine cedar staircase and chamfered cedar beams which the Trotts installed are still there, covered with white paint by a careless later owner. Why the Trotts chose to build immediately next to Captain Musson is unknown, but presumably, Samuel Trott had shipping interests which he wanted to oversee first hand. He and his father-in-law were partners in several ventures, including the acquisition of “Orange Grove,” and they may have owned ships together. 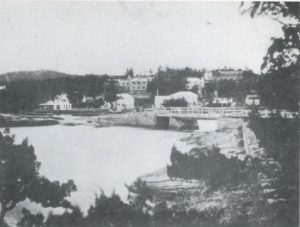 A photograph of Flatts Hill by James Heyl, c. 1880. William Musson, Jr.’s old home is in the middle of the hill, just to the left of the bridge. ‘Cap’n Sukey’s’ house is to its right. 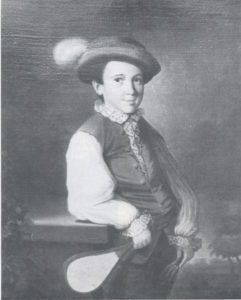 Samuel Trott is described by Miss Anna Maria Outerbridge as a “strong vigorous man, a typical joking Virginian, loved by everyone in his…parish. He kept open house [and] presided at all meetings of a public character in the parish and St. George’s.” He was appointed a member of the Governor’s Council in 1780, and remained on it until his death in 1812. At one point, he was President of the Council and Deputy Governor. “Frascati” must have known bright and festive days during his residence there. The Trotts had their hardships, however. One of their bitterest ones was the death of their youngest son, Clayton, who drowned in Flatts inlet when he was just a little boy. Elizabeth died years later, and Samuel moved back to “Walsingham.” Unfortunately, he suffered considerable financial losses, and his properties had to be sold after his death to meet his debts. John Musson, another of James’ children, had a colourful and varied career. Born at Flatts, he chose to make St. George’s his business base, and eventually owned ships, stores and a tavern there. 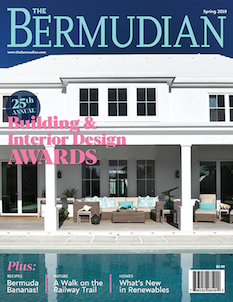 By the early 1800’s, he was regarded as one of the wealthiest men in Bermuda. He kept a country house at “Paynter’s Vale,” his first wife’s family home in Tucker’s Town, and evidently lived there in some style. He made sure that his children had all the advantages that they could, and sent his two sons to university in England. One, John Paynter Musson, became a lawyer and was eventually Chief Justice of St. Lucia. 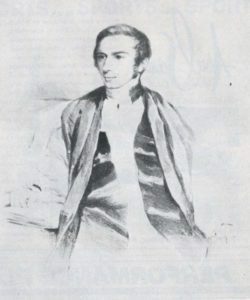 The other, Samuel Paynter Musson, became a clergyman and settled in Jamaica. Rev. Aubrey Spencer, Archdeacon of Bermuda and a grandson of the Duke of Marlborough. He married a grand-daughter of James Musson. John was evidently very pleased when his daughter, Eliza, married Rev. Aubrey Spencer, a grandson of the Duke of Marlborough. This marriage elevated this branch of the Mussons to the pinnacle of local society. Hard times were ahead, however. John’s businesses began to fail, and his financial support of the Spencers proved a strain. Eventually, he was refused credit in America, and had to sell “Paynter’s Vale” to raise funds. The story goes that he was saved from complete ruin by his marriage to a Miss Potts, daughter of one of his chief creditors in London, who decided not to press claims against his new son-in-law. John and his wife lived on in straitened circumstances in St. George’s, above what is now Meyer’s warehouse. Sukey was successful financially, but the world never would have known it, as she was very mean with her money. A sister who lived with her is said to have died from malnutrition. Sukey, however, had some sort of conscience and would take food to her sister’s grave at Smith’s Parish church as an atonement. When she died in 1844 at the age of 84, her heirs found a remarkable amount of money stored all over the place in her house on Flatts Hill – in teapots, under chair seats and stuffed in mattresses. One of her brothers, Robert Musson, used his share of the hoard to buy a horse and carriage, which was a luxury he had never dreamed of before. Photo at top: A photograph of “Frascati” by James Heyl, c. 1880. The eastern house was built by Capt. James Musson c. 1750, and the adjoining house to the west was added by Samuel Trott in the 1770’s.